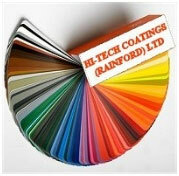 Powder coating is the process of coating a surface in which a powder material is applied using one of two methods. Metal Pre-treatment prior to powder coating is an essential step to ensure proper coating performance. Abrasive blasting is the operation of cleaning or preparing a surface by forcibly propelling a stream of abrasive material against it. Formed in 1992 but with over 25 years industry experience, Hi-Tech Coatings provides a wide range of customers with our Powder Coating service. Supplying all RAL & BS colours, we can provide the highest quality finish with FAST turn-arounds, all at competitive prices. Our pre-treatment facilities utilize the latest technology using non-phosphate treatments that provide excellent lifetimes of the finished product and conforms with BS6496 (Aluminium) and BS6497 (Steel). We offer a professional yet friendly service to all our customers and are happy to advise on the best solution to your needs as required.